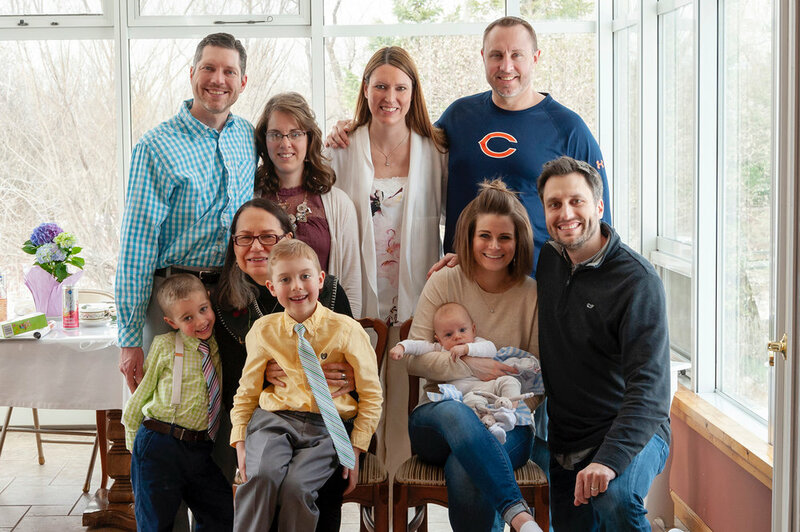 Last weekend, we celebrated Easter with Andy’s side of the family up at Fletcher’s cousins’ house! It was so fun to dress Fletcher in his little bunny slippers that our friend Jayme gave him! This little hooded cardigan is one of my favorite articles of clothing that he owns and I’m so sad that this was the last time he wore it! It’s now in a bin of his outgrown clothes on a shelf in our basement that we’ll save for baby #2. We ate lunch with the family and then Fletcher opened his Easter baskets — he received so many nice gifts from his aunties, uncles, cousins, and grandma! We took a few family photos and then we were on our way home! Andy suggested swinging by our favorite froyo shop on the way home and I’ll never say no to that! On Easter Sunday, some of my family came over for lunch! Fletcher sported his cute little bib that his Auntie and Uncle gave him! My mom made her famous chicken parmesan, along with some cheesy bread, and a few veggie sides. We made a replica of the classic Olive Garden salad, and raspberry lemon bars! 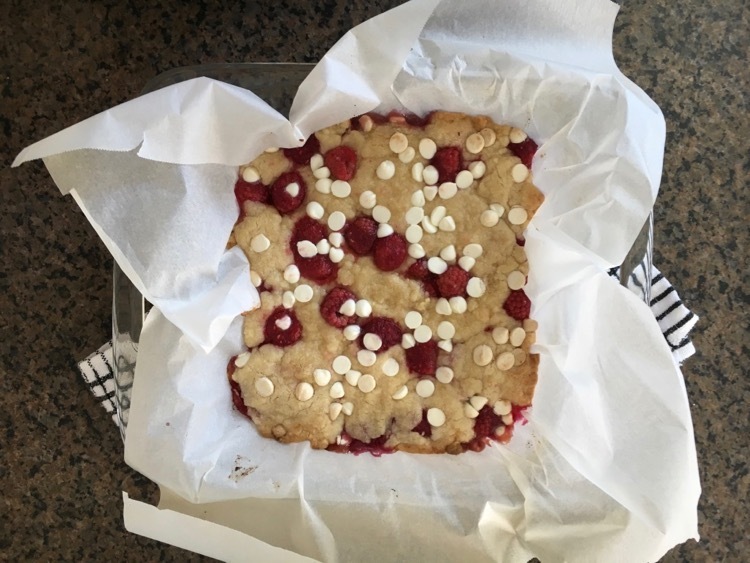 I used the same recipe for our favorite cranberry bars and just added white chocolate chips, raspberries, and lemon zest instead of cranberries! 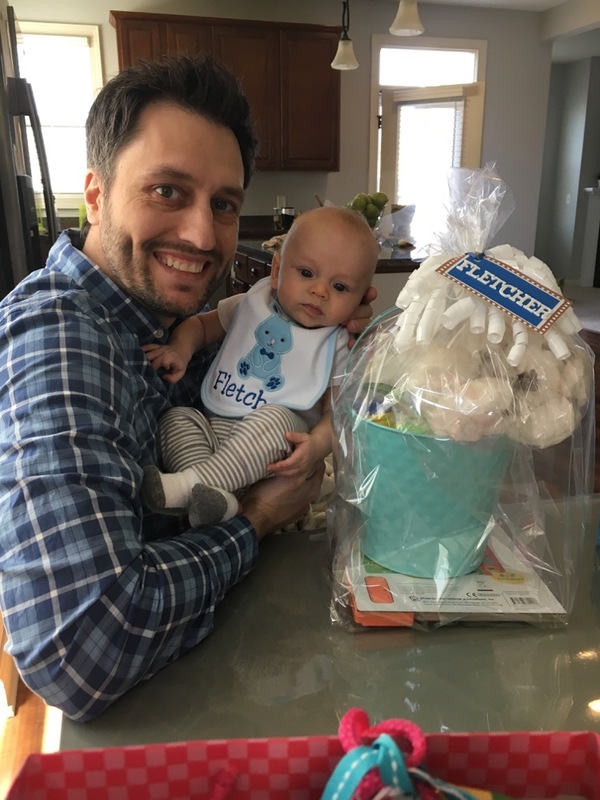 My parents brought Fletcher a fun little Easter basket filled with all kinds of goodies like bubbles, a stuffed bunny, and a ton of books! We also snapped a few family photos of us to add to his baby book! After lunch, we all went for a walk to the park where we sat outside for awhile to enjoy the gorgeous day. It was upper 70s and sunny and we kept saying how long it has been since we have had a beautiful Easter Sunday like this one. Once everyone left, we took Fletcher around the house to “look” for his Easter basket since we didn’t have time that morning. He loved opening his gifts with dad! We’ve started a tradition to get him a card for each holiday and Andy always chooses a great one for Fletcher! My mom used to always take flat lays of our gifts when we were little and I always loved looking back at previous years’ gifts so I’ve started doing this for Fletcher, too. Fletcher just entered Leap 4 (Wonder Weeks) and has been SO into books lately! 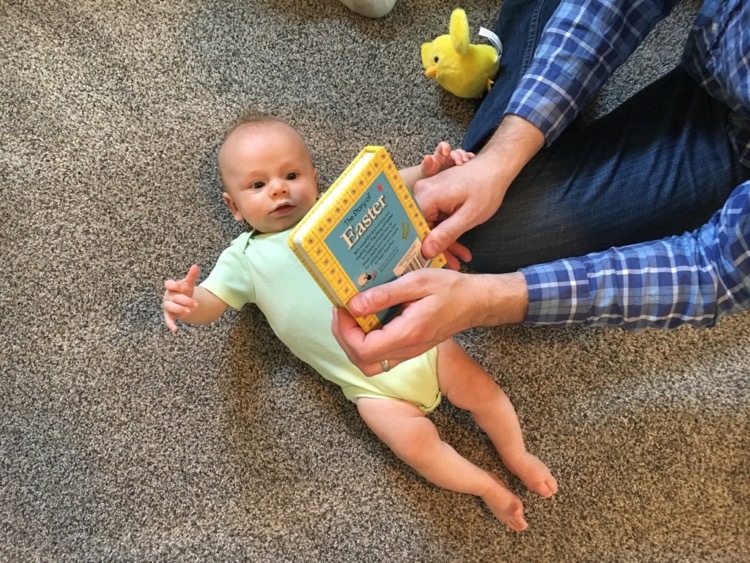 He loves to hold them and try to turn the pages all by himself. I’ll update this after his pediatrician appointment this week! He’s pretty much out of the preemie clothes and his newborn clothes finally fit, so it’s been super fun to dress him in little outfits! He’s still in newborn diapers and probably will be for awhile still. Fletcher dropped one of his morning naps, but still takes multiple naps per day, including a few long ones (3ish hours). He still only wakes up once in the night to eat which is so nice for Andy and I! I usually use his nap time to work on the computer, clean up the house, or do a quick treadmill workout. We’re still following the wake, change diaper, eat, play, sleep cycle and we’ve gotten a little more regular with it this month. This seems to work really well for him because it keeps him from hitting that “hangry” point. Looking at books, his Mamaroo swing, napping on Andy and I, car rides, playing with his plastic ring toys — he has started holding them and bringing them to his mouth on his own now, being bounced, listening to us sing silly songs, and doing tummy time on the floor. On Fletcher’s “two month birthday” (3/13/19) he rolled over from his tummy to his back! It was so fun to see and since then I’ve seen him do it one other time! He also has started smiling socially and making cooing noises which we think is the cutest thing ever! Fletcher met my parents a couple weeks ago! Pediatrician, chiropractor, Target, Trader Joe’s, out to lunch with my friend Jayme, a road trip to Robertson Ranch to meet his grandparents, and the library. Fletcher James is already one month old! Part of me is a little sad about this, but I’m mostly really excited because as he gets older, he can do more and go on adventures with us. 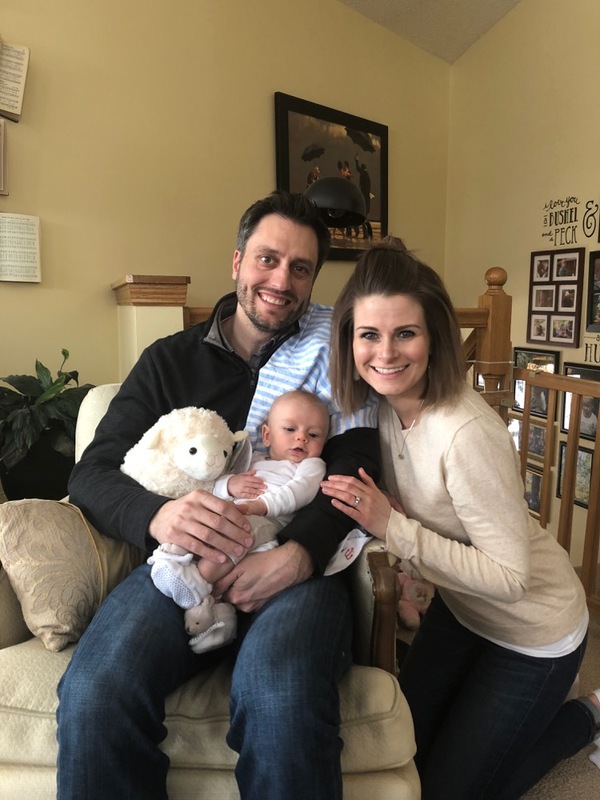 I’m really making it a priority to savor this season and to really live in the moment so although his teeny tiny newborn days are already behind us, I’m loving our sweet time together with our little one month old! I’m not sure if I’ll do these updates every month since a lot of this is already in his baby book, but for now we’ll roll with it. This monthly template was inspired by the one that one of my favorite bloggers uses for her kids. 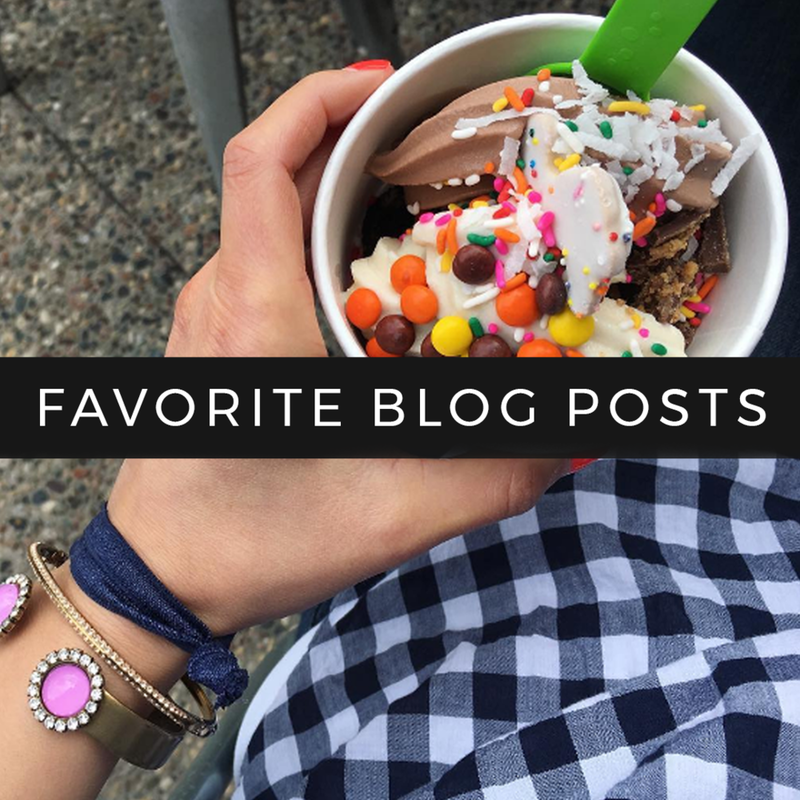 If you aren’t following her, be sure to check out her blog — she is the cutest, most intentional mama and I find her relationship with her husband and kids so inspiring! He is 21 inches long and 7lb 13oz as of 2/14! Little guy has been packing on the pounds since birth! 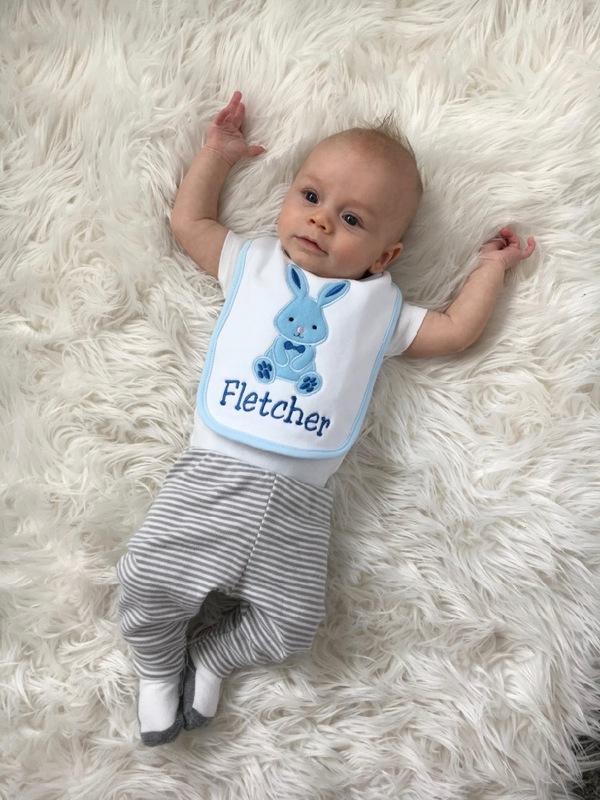 Fletcher is just starting to fit into his newborn clothes which has been so fun now that things are fitting him well! In the first few weeks, we had to roll a lot of his sleeves up and fold down the waistband of his pants in order to get them to fit. We had a few preemie onesies and those seemed to fit the best since he was just over 6 pounds when we brought him home! As for diapers, we used the newborn size this month, but looking back, I think it would have been a lot easier to buy a preemie pack or two since we had to fold down the waistband of the diapers for a few weeks in order to get them to fit! He’s a little peanut but he is growing so fast! He’s a great little sleeper and that has honestly made having a newborn so much easier than we were anticipating. 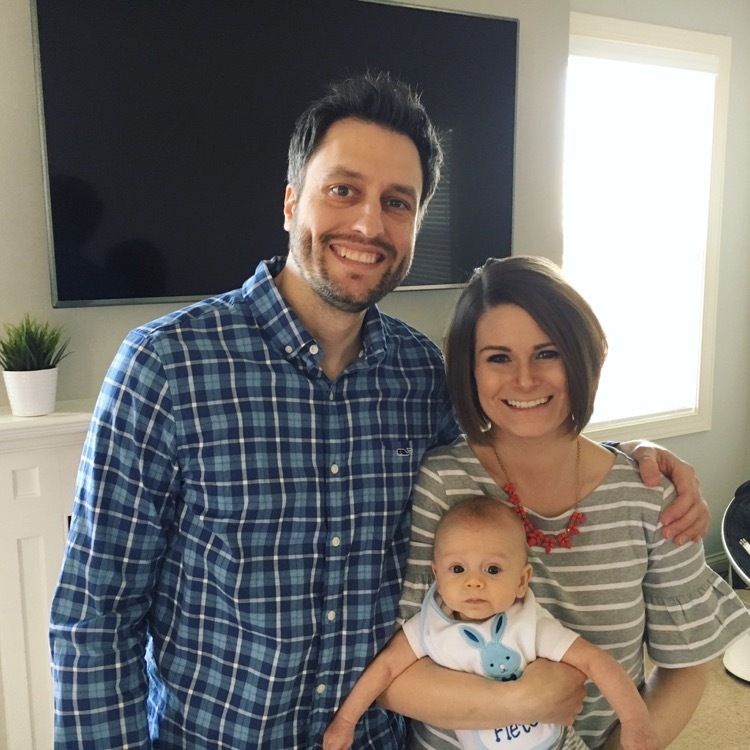 The majority of the time, we can put him in his bassinet awake and he will fall asleep on his own — once in awhile he struggles to soothe himself to sleep and it’s usually because his swaddle isn’t tight enough. If he’s swaddled even slightly too loose, he will grunt, wiggle, and cry until his arms are free and won’t give up until he has his hands in his mouth and is happily sucking on his fingers. I’ve just started doing the whole “babywearing” thing mainly so I can walk on the treadmill in the mornings and he loves being in the baby wrap so, so much! He’s usually out like a light within minutes of me putting him in there and he will sleep in there for a good two hours or so while I go for a walk and then eat lunch. I swear, his best naps are in that wrap! He takes several naps throughout the day — some are little catnaps while others are a couple of hours. We’re still playing around in this area since he’s still so little, but our day usually is a constant stream of eat, burp, change diaper, play, nap, repeat. Sleeping on our chests, bouncing, having us sing to him, the hairdryer (this is our magic trick for getting him to stop crying — it literally works within seconds every single time! 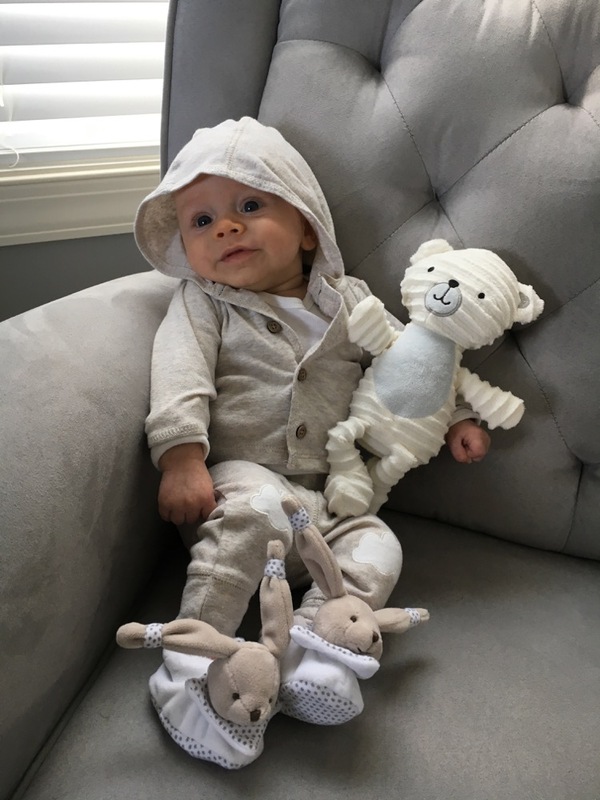 ), reading books, listening to his lambie that plays music, his Pooh bear rattle, car rides, snuggling, getting his hair combed, sitting in his monkey chair, being wrapped up with his blankets. Being picked up with cold hands, diaper changes, baths, being hungry, being overly tired, having lotion applied. He can scoot around almost 360 degrees in a circle when he’s laying on the floor and he almost rolled over from his back to his tummy the other day! I couldn’t believe it since he is so young, but he was determined to reach a toy that he had accidentally batted away from him. He’s also started to cry real tears (when they’re a brand new baby, no tears come out!) and his neck is getting stronger every day! I’ve started a little tradition with him where we have an “adventure chat” before bed. I’ll lay with him on our bed and talk about all the things we are going to do together as he gets older — I started this one a whim one night and thought it was so funny how he looks me in the eyes and listens SO intently, so we’ve kept up the routine. Pediatrician, chiropractor, Starbucks and Chick-Fil-A drive throughs (haha), pediatric dentist, and a visit with the OB that delivered him.